Padam, her son Hum, a granddaughter (red), and great granddaughter (green). 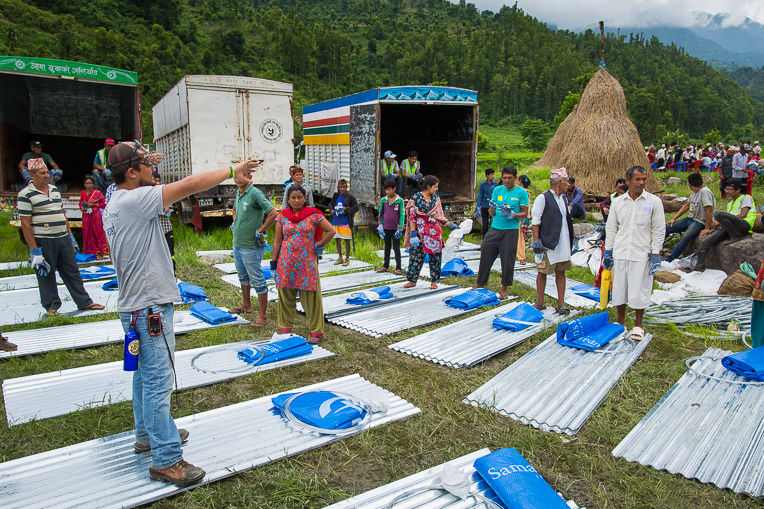 Shelter materials offer protection from monsoon rains in Nepal. Rain drummed the metal roof above Padam Kumari as she shelled corn with her family in their new shelter. They constructed it with iron sheets, pipes, wire, plastic, and other materials given to them by Samaritan’s Purse. 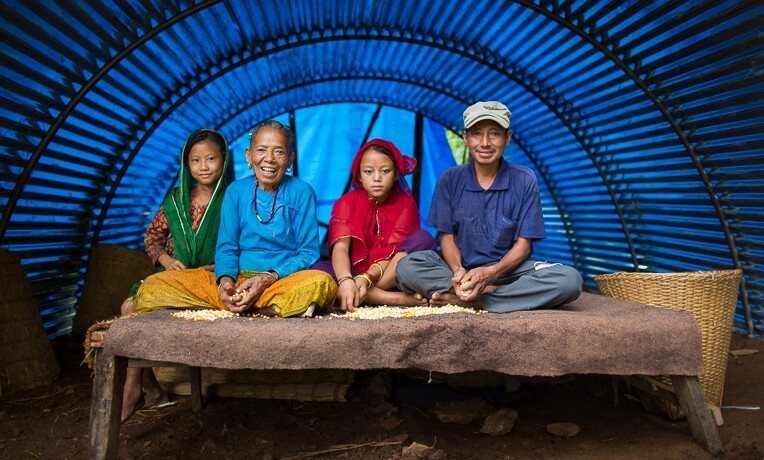 Now the family is ready to weather the monsoon season together in the mountains of Nepal. Monsoon season in Nepal runs from June to September and makes mountain roads impassable due to mud and landslides. Hundreds of thousands of families like Padam’s live in rural, hard-to-reach areas of Nepal and lost their homes in April’s devastating earthquake. Many of them also lost their livelihoods. With no resources and heavy rains approaching, it is a race against time for families to find protection from the elements. Men, women, and children walk for hours down rugged paths, across rivers, and along landslide-prone roads to obtain shelter materials. 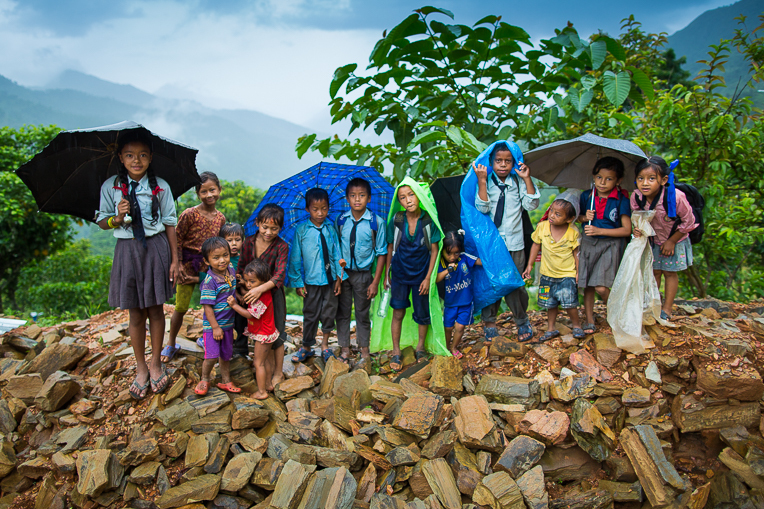 Samaritan’s Purse has made shelter a top priority of our work in Nepal. We are providing materials to 25,000 families in need—most living in remote, mountain villages. Full shelter kits consist of rounded steel pipes, bundles of corrugated galvanized iron (CGI), wire, tarpaulin, gloves, and a toolkit. Partial shelter kits include CGI, tarpaulin, wire, gloves, and nails. Men, women, and even small children walk for hours down rugged paths, across rivers, and along landslide-prone roads to get the materials. For Padam’s family, it took an entire day to transport their full shelter kit down the rocky road, across the river, and up the muddy path to their land, tucked away on the side of a mountain. They carried the supplies on foot for the latter part of the steep journey. It’s families such as hers that our teams are focused on reaching—both to help meet their physical needs and to let them know they aren’t forgotten. “We are just here to serve and to help,” Neyer said. Our staff also holds training sessions for communities to learn how to most effectively use the materials and also to gain knowledge on earthquake-resistant construction. Neyer Corredor organizes a shelter distribution in an area of Nuwakot where 90 percent of families suffered damage to their homes. Padam said her family plans to stay in their new shelter for years to come. And as the rain continued to fall outside on the tall grass and down the dirt path to the remains of their old home, they all stayed dry inside.